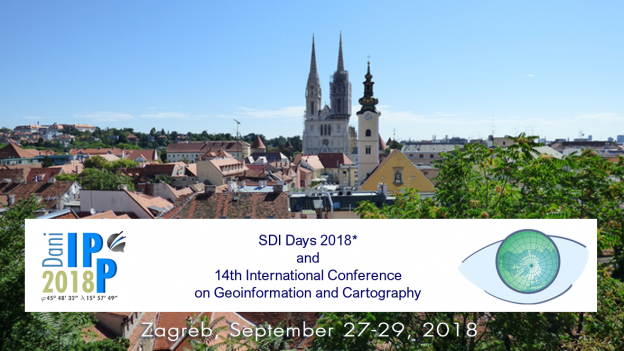 By organizing the SDI Days 2018 and 14th International Conference on Geoinformation and Cartography, the State Geodetic Administration, the Croatian Cartographic Society and the Faculty of Geodesy of the University of Zagreb wish to contribute to the development of spatial data infrastructure, geoinformatics, cartography, geodesy, geography and associated fields. A wide range of themes and renowned invited lecturers guarantee interesting lectures and a contemporary approach. Development of NSDI has been based on the NSDI Strategy, which was adopted by the Croatian Government last year. This year's SDI Days 2018 Conference aims to contribute to the development of NSDI through an overview of the situation, exchange of experiences and capacity building to successfully resume the establishment, overcome challenges, awaken and use new opportunities arising from the interoperable use of spatial data. Challenges of curriculum development for SDI, implementation of SDI in study programs and results achieved in this field are some of this year’s topics of the conference on Geoinformation and Cartography. Since maps are a medium of communication about space and in space and geographic names are an indispensable part of communication, the link between cartography and toponymy is clear. Despite many scientific papers on geographic names and spelling rules pertaining to writing geographic names, Croatian geographic names have still not been systematically addressed. Because of that, the topic of geographical names will also be one of the main focuses of this year’s conference on Geoinformation and Cartography.